Charming and Eclectic Elevated Key West style 3 Bedroom 2 Bath home with 2 Bedroom 1 Bath attached Guest House. 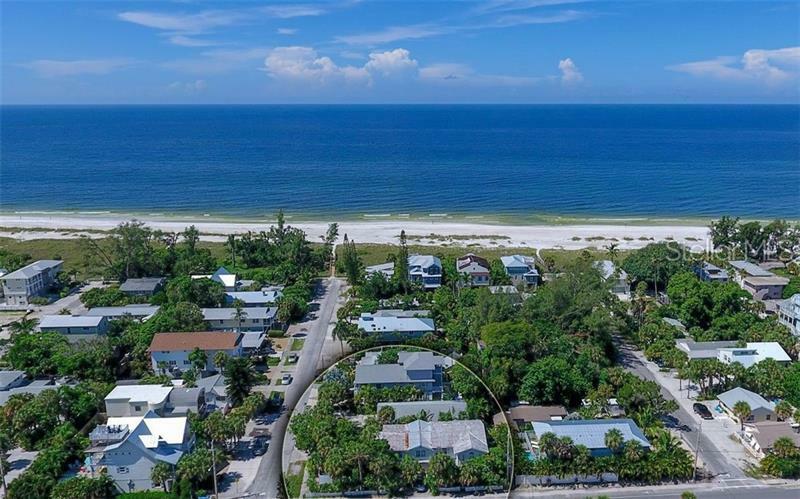 Perfect location in The City of Anna Maria, West of Gulf Drive!! Only a few steps to direct beach access and the Gulf of Mexico! This large island home has the old Florida charm and feeling of an Ernest Hemingway novel being written here. It's a must see! Feel the ocean breezes relaxing on your front porch swing or swaying in your hammock under the palms. Once inside you will love the open living spaces, natural light and large bedrooms in this colorful home. There is also a big office/den bonus room near the master suite. Plenty of room for the whole family and all your friends. Guests will enjoy the spacious attached private bungalow with separate entrance. This property would be a wonderful family home or rental investment. Plenty of parking for everyone, garage, workshop, and extra storage areas for beach toys or golf carts. You are surrounded by lush mature tropical vegetation for privacy, but you are still in the center of all the island action. Trolley stop outside your door with restaurants and shops just around the corner. Call today to see this page of time in paradise!